Can you believe we've been in Phoenix for well over a year now? Probably not since I haven't posted in FOREVER. Life has been crazy busy and fun things like taking pictures of our projects have not made the list recently. Hopefully that will change... 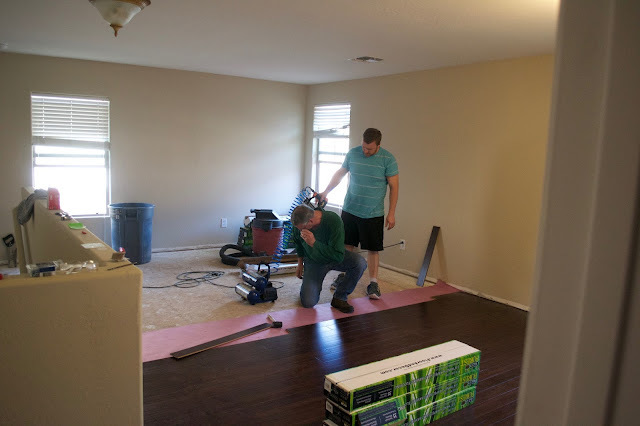 Regardless, we still are working on the house, and we will eventually share all the work we've done. It definitely won't be in real time though. If you want more real time pics, or more pics of the kids, you can follow along on Instagram. I do manage to get shorter little snippets on there on a regular basis. We do have some completely finished rooms now (yay!). 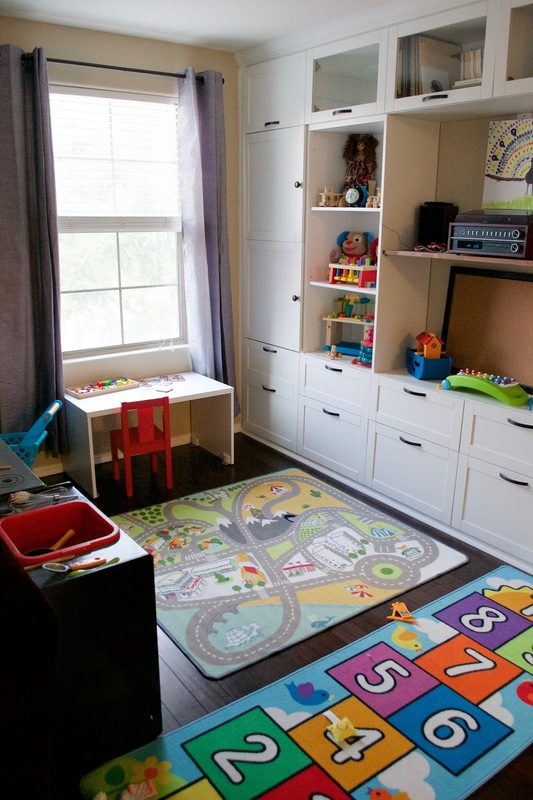 I most recently finished off the final touches of the playroom. 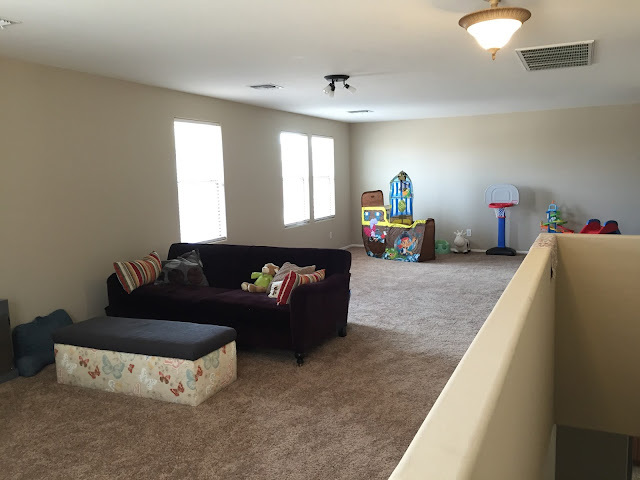 This is the loft space that is at the top of the stairs. Initially, this space was huge. In my opinion, it was awkwardly big, with odd placements of lights and windows. 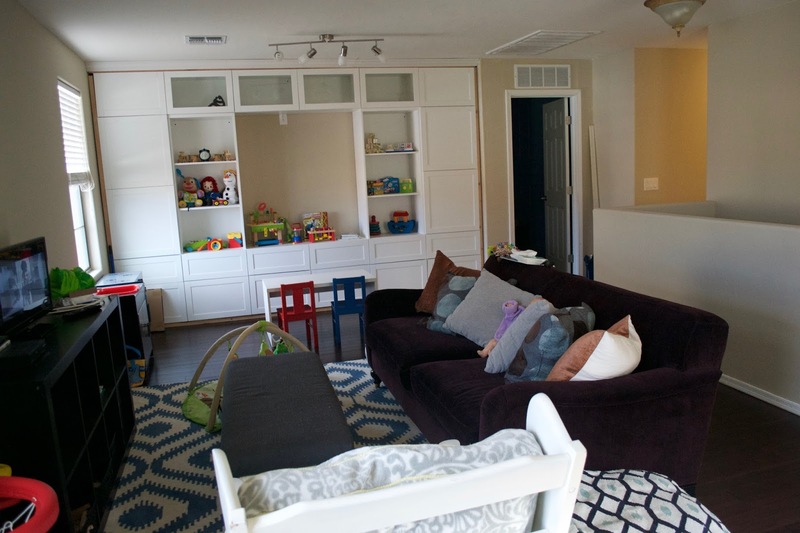 From the beginning, we knew we were going to take the back half of the room and make it into Maisie's room. 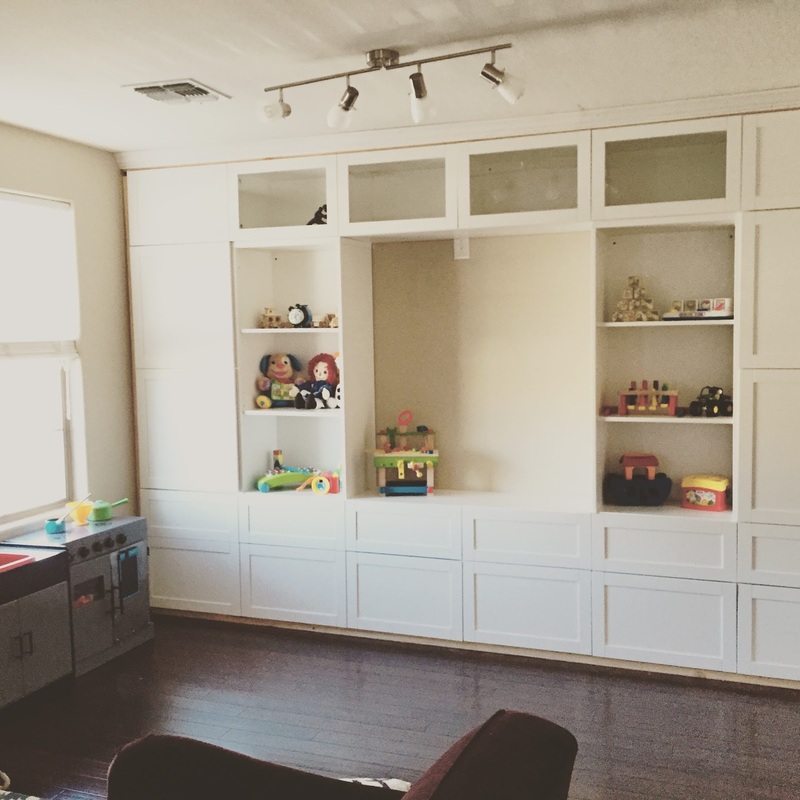 For the playroom's side of things, this involved a lot of planning for the wall since we wanted to have built-ins for all the toys for the kids. 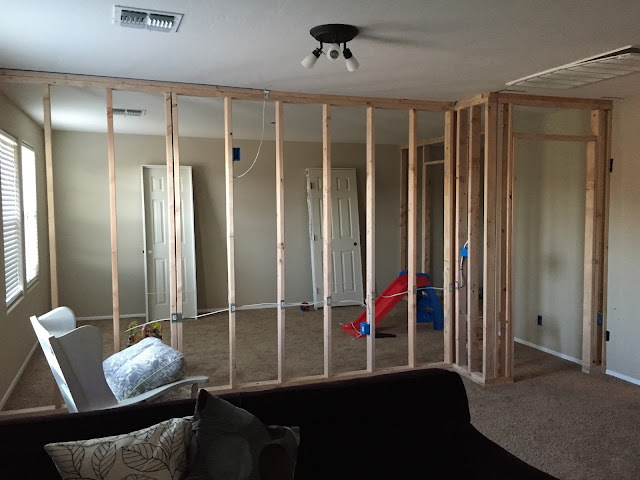 Once we had a plan, Nate built the wall fairly quickly which immediately changed the feel of the space. 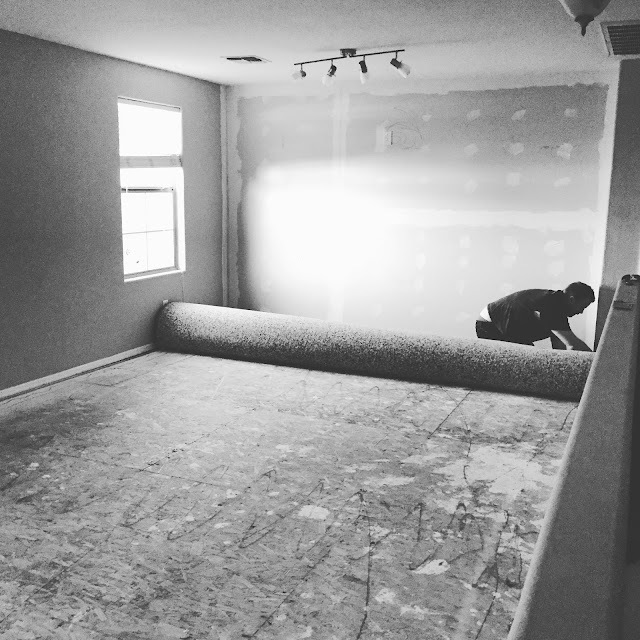 If you're wondering about the carpet, we did build the wall over the carpet. I think we checked with the inspectors at least twice to make sure this was legit... which it was. 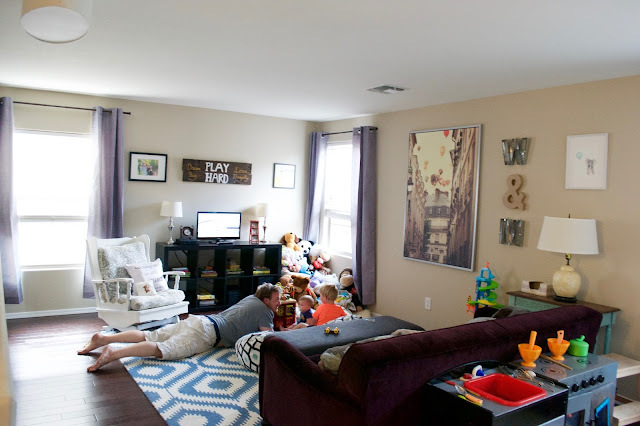 The reason we did this was because we wanted to leave the carpet in Maisie's rooms so that all the bedrooms would have the same carpet, but we were planning on taking out the carpet in the playroom. There was this really awful tile that was mostly loose in the hall and so the plan was to replace all the flooring in the playroom through the hall. 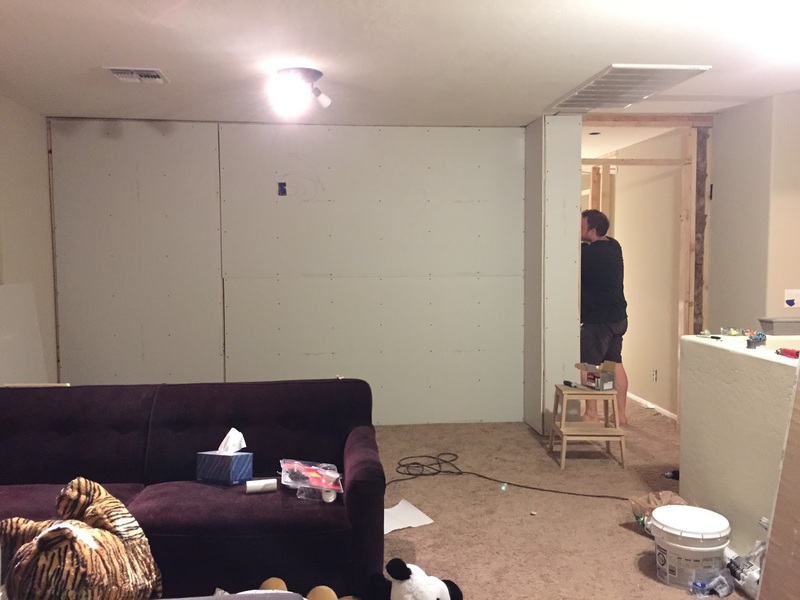 By building the wall over the carpet, we didn't have to figure out how to cut the carpet ahead of time. We could just cut it away on the playroom side. 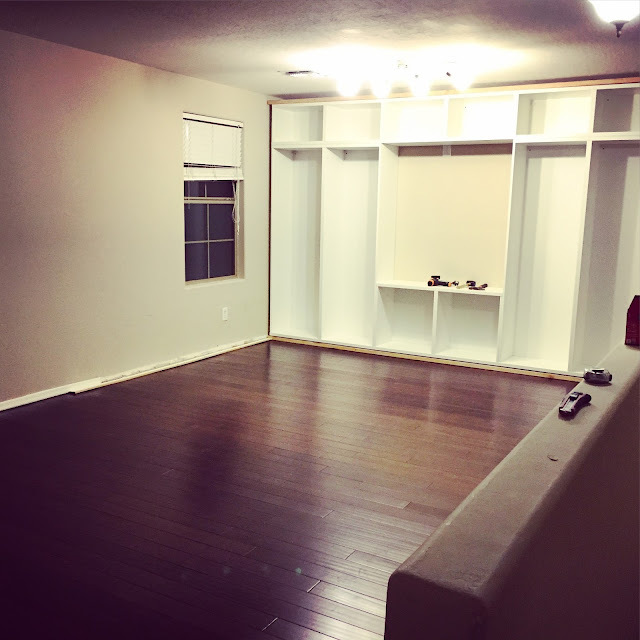 We went with a bamboo floor from Floor and Decor for the open space upstairs. My dad and Nate installed the whole thing in a weekend. And then came the cabinets. 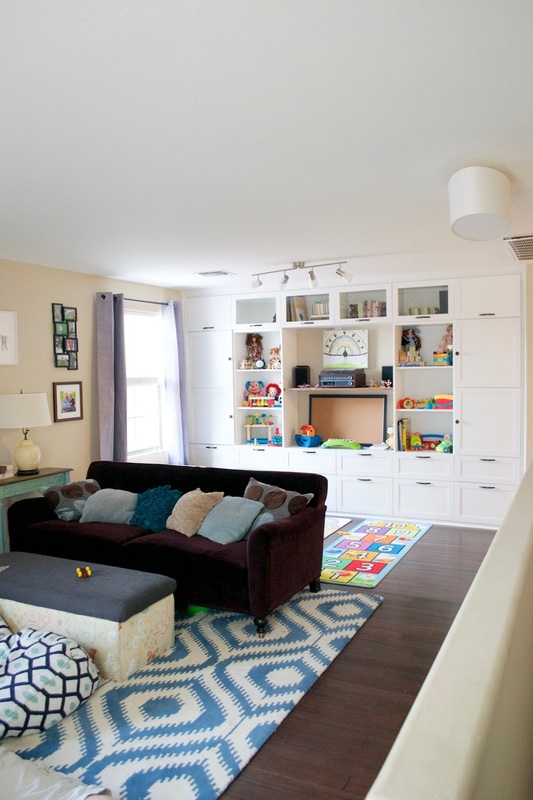 We went with the Besta System from Ikea. We managed to get them on sale by chance so they were a little more affordable for us. 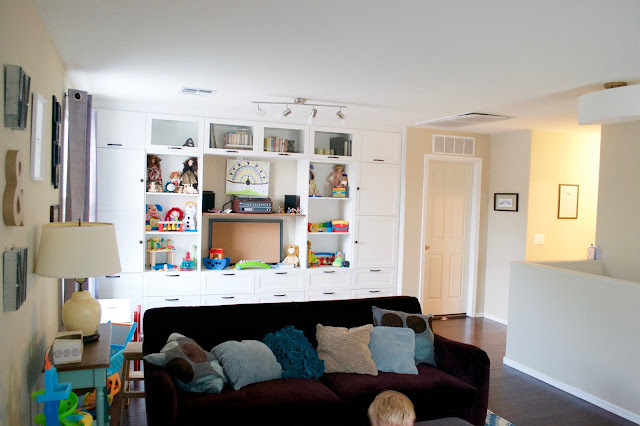 We've had really good experiences with Ikea's cabinets, but this was the first time using the Besta system. We really thought the quality was really superior to some of the cheaper bookshelves, so the price difference was definitely worth it. After a lot of putting things together, we had all the doors and drawers installed. You'll notice that you can see wood all around the unit. 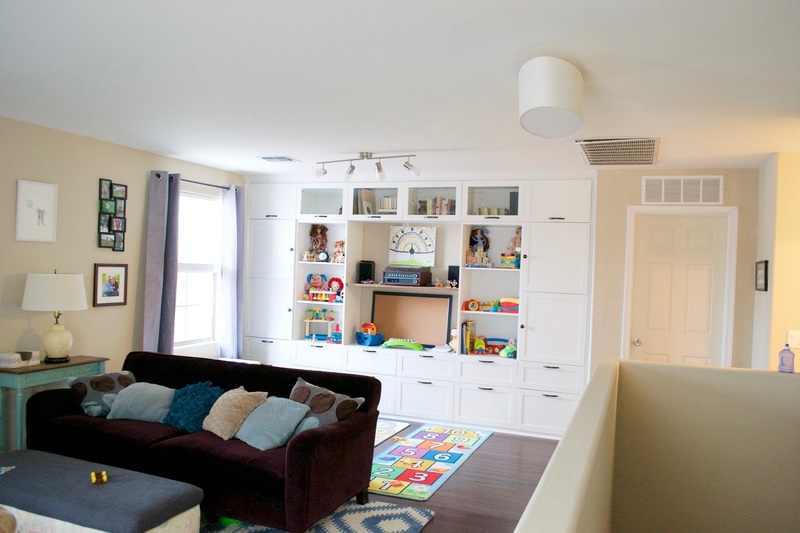 This is for installing trim so that the unit would be completely integrated into the wall. We put the furniture back in, and it stayed like this for quite some time. If you've been around this blog for awhile, you know we like to get things functional, and then tend to make very slow progress on the finishing touches. At least we're consistent... right? 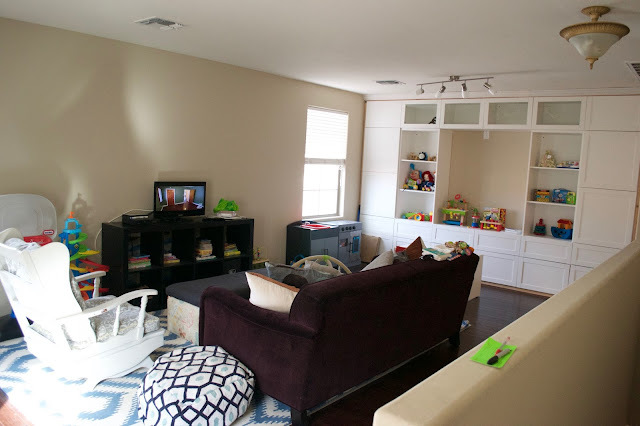 Fast forward a few months, and I've finally gotten around to installing trim, caulking, touching up paint, hanging curtains, decorating, and deciding that the layout wasn't great. We actually ended up going back to how we originally had the furniture arranged. 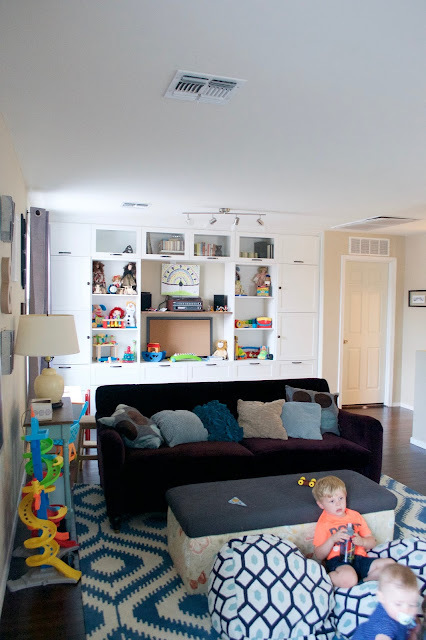 Now that the space is smaller, it feels right, and it allows for the kids to have a space totally theirs behind the couch and to have more of a den feel in front of the couch. I love hanging out up here. It's way cozier than our downstairs living room and I love that Will plays in here all the time. He knows which drawers has his toys in them and so he can play pretty independently. So that's the playroom! Are you a fan of cozier living spaces or do you love the huge open floor plans?